As you get better with grilling and more stomachs to feed, getting a basic 2 burner gas grill may no longer be enough. You won’t be able to fit more than 10 burger patties at the same time, thus, tend to take more of your time cooking with it and even increases your fuel expense as you had to keep it running longer. But getting the traditional full sized grills is not always ideal as well, especially if you don’t have the room to accommodate them and even worth spending the extra cash for cooking space that you will not fully utilize. Hence, the 3 burner gas grills are the way to go. It’s a little bigger and have more power, but still smaller than most full sized models. Weber Spirit E310 has a simple design and easy to use. It has everything that you need for a basic grill, but with some additional perks. With Weber, you can be assured that its construction is sturdy, has quality metal parts and it has a solid and thickness feel to it. To get to know more about this unit, here is a quick overview of its features. As I have mentioned, Weber Spirit E310 is a basic grill. You get a good heat capacity of 32,000 BTU per hour and 424 square inch of cooking area, plus an extra 105 square inch for warming, which is already large enough. The heat output is a little low for the size but can still get really hot. It can reach high temperature of up to 550 degrees without any problem and it has a superior heat retention so it can cook the food thoroughly and deliciously. It includes a Flavorizer bar that adds more taste, which is one of its additional perks to offer. Although its parts are not made of stainless steel, it is still composed of porcelain enameled-coating which is durable, doesn’t get peeled off easily and a great alternative for stainless steel. It has lots of parts to put together, so assembling it might take some time, but that is also to assure firmer and solid formation. One of the best perks it offers that you cannot easily find on other 3 burner gas grills is its capability for easy conversion to natural gas grill. Weber brands offer the most available gas grills with natural fuels. But the Spirit E310 is one of the available natural gas grill with an affordable price since most of these griddles are in the range of more than $700. While the natural gas model for Spirit E310 is only priced at around $620, or find a deal as low as $520 on Amazon. This offers great value. It also got a high satisfaction of 4.6 out of 5 star rating. If this got you interested, you might also like the Weber Spirit E320. They both have similar features but the E320 got an additional side burner, which you can use to cook the side dishes or warm the sauces to pair with your food. The Char-Griller 3001 Grillin’ Pro has the most grilling heat power for a budget gas grill. 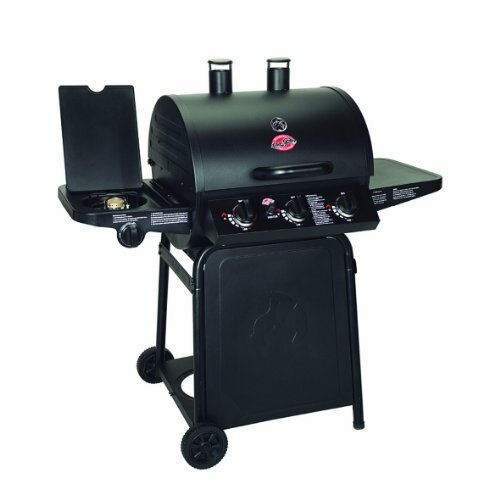 This is an inexpensive full feature grill with a pretty decent heavy construction compared with similar options available. Although it has lower value among other full featured household grills, expect a satisfying grilling experience with this bad boy. Its build quality is pretty decent for the price and as I have mentioned, its construction and parts are moderately heavy. This is a grill that can definitely last for several years, especially with proper handling and care. However, one downside you should take into consideration is that before you can enjoy grilling with this machine, the assembly has been noted as challenging and time-consuming. And since its parts are heavy, it will be ideal to have two people put this one together. Some of the materials used here can also get rusty and its wheels are actually made of plastic; but depending on how often you grill and how diligently you maintain the 3001, some users were able to keep this machine running well beyond 3 years. Fair warning though, cleaning this grill is not as easy as other comparable models since the area under the burners is a little hard to reach and keep scraped out. The upside is the total cooking area of 630 square inches and 3 burners are generous and a great advantage. You can cook numerous types of meat and sides all at the same time, great for medium to larger gatherings. It heats up very fast and reaches up to 600 degree temperature in rapid time and cooks evenly. The side burners are also a great addition. Unlike most low-end gas grills, this one has enough thickness to hold and keep the heat in that can also sear steaks and cook meat at high temperature. The average of 40,800 BTUs for a 438 square inches of primary grilling space is just right and still falls within our best heat to energy usage ratio. From its introduced listed price of $279.99, you can now almost always purchase this for lower than 200 bucks on the market. Amazon is also offering this product for an average price of $168.88. It also received a pretty decent rate of 4 out 5 stars from consumers. Because of the consumer approval and all the great features it can offer, the Char-Griller 3001 Grillin’ Pro was a must on our list. The Weber Genesis Gas Grills have 4 variations to choose from. But all of them have 3 burners, and also have a superb performance to be proud of. 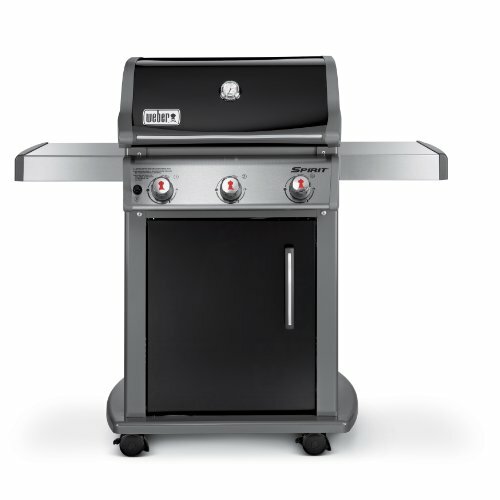 That’s why if you are looking for 3 burner gas grills, the Genesis gas grills are ideal options to check out. All of them have similar features in terms of heat capacity, total cooking area and dimension. These grills have a heat output of 38,000 BTUs for the main burners, 637 square inches of cooking space and have an overall dimensions of 64.5 x 60 x 30 inches for height, width and length when the lid is open. The Genesis gas units have one of the largest cooking area to offer among other 3 burner gas grills in the market. But if you want to own all the complete features that can be found in Genesis models, the Weber Genesis S-330 is the way to go. It has durable and sturdy construction, made with stainless steel, and includes a dedicated sear station burner. That is also without to say that this is the priciest among the bunch. The E-330 is its lower grade counterpart as the parts are made of porcelain-enameled parts. Nevertheless, porcelain coating metals are still of high quality and can last for years. The E-330 also has a sear station burner and available at a more affordable price, which can save you at around 150 dollars. We also get this featured in the Best Gas Grills under 1000 dollars and for natural gas grills. All of the Genesis models are available for conversion to natural gas fuel. So it’s really worth to consider. 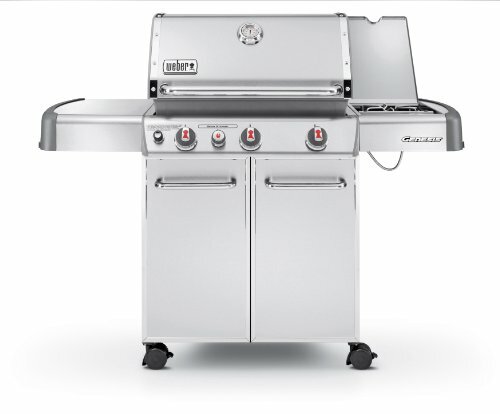 You can learn more and read all about it which you can find under the Best Gas Grills tab or click on the link for Weber Genesis Series. Like other reviewers, I puercashd these stainless steel flavorizer bars to replace my rusted enameled bars. After two years of average use (grilling once a week or so during the summer), as I was cleaning my grill I realized that these stainless steel bars are rusty quite rusty, on both the top and bottom. I was surprised, so I contacted Weber customer service about the rust on the stainless steel bars. They explained, and I quote: The flavorizer bars will rust within the first year of use. This is normal due to the amount of abuse they take protecting the burner tubes. We recommend that you replace the bars once they break or fall apart. I would suggest rotating the bars for a longer longevity. Fine. No problem. Based on Weber’s recommendation, I assume the flavorizer bars are still doing their job, even if rusty. However, I now believe I was too hasty in replacing my old bars. And, when it’s time to replace the stainless steel bars, I may just replace them with the less expensive porcelain enameled bars.